In 1968, Yvon Chouinard, Doug Tompkins and a handful of other climbers from Southern California dropped everything, bought a van and drove to Patagonia to climb Fitzroy. This 5,000 mile journey into the heart of the South American mountains became a focal point of the climbers lives. They felt that the journey to get to the mountain was just as important as the mountain itself. Indeed, Chouinard, who started the Patagonia clothing company, sites this trip for his later involvement in conservation efforts throughout the world. And Tompkins also sites the trip as the inspiration that led him to eventually move down to Patagonia in order to help create national parks in Chile. The newly released film, 180° South, doesn't really go into much depth about that initial trip to Patagonia. Instead, the film focuses on a much younger adventurer named Jeff Johnson. Johnson saw a film entitled, Mountain of Storms, about Chouinard and Tompkins 1968 trip. This short film inspired Johnson to make his own trek south in the search of adventure. Johnson picked out an obscure Patagonian peak and some friends to join him on it. The friends included Chouinard and "the-funny-man-of-climbing" Timmy O'Neil, as well as pro surfer Keith Malloy. Along the way, he also befriends a young woman named Makohe whom also joins them on the climb. To imitate Chouinard's and Tomkin's long ago journey, Johnson gets "hired" to help crew a 57-foot sailboat down to South America. While he didn't exactly imitate the 1968 van ride, he did imitate the adventure of the travel. Johnson experiences everything he could experience on a small boat during the journey from seasickness serious damage at sea. When Johnson finally arrives in Patagonia, he and his crew bushwack in and try to climb Cerro Corcovado, a striking glaciated peak capped by an imposing rock tower overlooking the ocean. 180° South is a beautifully crafted film. Stylistically it is quite similar toBanff Mountain Film Festival films like Take a Seat, the documentary about the tandem bicycle rider who road 20,000 miles from Alaska to South America, always looking for someone to join him on his bike. Or like Alone Across Australia, another Banff film about an adventurer who walks across Australia pulling a cart with his dog. These are the outdoor adventure films that strike home and 180° South can easily hold its head up among these other classic documentaries. 180° South is an absolutely phenomenal film. It encompasses all of the elements that make for a beautiful "mountain" (in the Banff sense) film. It explores conservation and culture through the lens of adventure sports and it gives us some insight. One element that works some of the time, but doesn't work consistently thoughout the film is a thematic connection between the mountains and the sea. Much of the film is about a boat journey and surfing, but then the piece transitions into a mountain phase. Once in the mountains they do repeatedly callback the sea...but as the narrative shifted away from the sea, it would have made more sense to focus on that environment. 180° South was released on DVD, at a series of theaters and on streaming video almost simultaneously. And while this has happened with a handful of films over the last five years, it's not terribly clear why they did this with the documentary. For most viewers, it doesn't matter. The film is accessible immediately on Netflix via streaming video. Yvon Chouinard is an icon in the outdoor and climbing world, and this film helps us to understand what has motivated him. It is the same thing that motivates each one of us each time we go outside. The trailer for 180° South can be viewed below. To see the film's website, click here. Water is a powerful and amazing thing. Back in the early 1900's the little Norwegian town of Rjukan harnessed this power and built the first hydroelectric powerplant in Norway. Since then, it has gone through a series of highs and lows, and now it has emerged as an amazing destination for ice climbing. A 30 minute tram ride takes you from Baguettes and Cafes to some of the most technically challenging terrain out there. It's no wonder why some of the top alpinists in the world call Chamonix their second (or even first) home. Gaining precision through persistence. Breaking your project into a series of smaller attainable victories. Overcoming the improbable. All of this is part of honing your craft and good advice to apply to not just your climbing, but the rest of your life as well. Popular books like Freedom of the Hills, Rock Climbing: Mastering the Basic Skills, and Alpine Climbing: Techniques to Take You Higherhave gone a completely different route. Instead of SERENE, they use ERNEST. Our first video this weekend was made not so long ago, in a ski town not so far, far away... It's Mt. Bachelor Strikes Back!! Maybe if you were a good boy or girl this year, you'll get some Legos for Christmas and can make your own sweet Lego snowboarding video like this one! And lastly, I couldn't pass up some good ol' Skiing Santa Videos! I never used to stretch before climbing. If I was climbing outside, my idea of stretching was the walk to the crag, and climbing an easy route first to "warm up a bit." If I was training at the climbing gym, I would do a lap traversing the gym and call it good. Forget it. Fortunately, I never injured myself 'climbing cold' like this, but rather discovered the benefits of stretching after going to a few free yoga classes at my local climbing gym. After the sessions I would go climb, and noticed the difference right away. Suddenly I could pull moves that would usually send me chucking. High-stepping was no longer such a big deal. Difficult moves that I would have tried to power through I now had the confidence and flexibility to finesse. But eventually I was out of free yoga sessions- surely there were some resources out there for climbing-specific stretches. Stretching not only helps with injury prevention and flexibility, but also allows you to get more mileage out of your training and climbing sessions. According to a recent study by Dr. Wayne Westcott, author of more than 20 books on various types of exercise and strength training, stretching the specific muscles used after any type of workout can produce a 20% more gain in strength than can be achieved by just working out. You can read more about it here. Research shows that stretching before, during, AND after is ideal. If done correctly, stretching before climbing will increase your flexibility and prevent injury, while stretching during and after will help with muscle balance and recovery time. Stretching during climbing may be hard in some settings (alpine/multi-pitch), but if you're at the gym or the crag, it's pretty easy just to do a few stretches in between laps. I have achieved the best results in performance from warming up with 'dynamic' stretching. Dynamic stretching is defined as smoothly moving through a full range of motion. When developed for sport-specific movements, dynamic stretching is widely considered the best way to increase blood flow and helps to reduce injury. There is a great article on dynamic stretches for climbers with detailed pictures here. When stretching during and after a workout or climbing session, it is best to practice static stretching, which is where you hold a single position for a set amount of time (usually 30 seconds or more). Doing yoga qualifies, and Kaylee Frano, an indoor-climbing youth team coach, has written a great article with the specific stretching routine she uses for her team, as well as including a more in-depth look on what the benefits of post-exercise stretching are. Her article is here. A common problem many people run into when they first begin stretching regularly is called 'stretch reflex', where you stretch too aggressively without any type of warm-up. At the least, stretch reflex can lead to decreased performance; at its worst, a pulled muscle. Before you do your pre-exercise stretching, try doing some jumping jacks, push-ups, sit-ups, or very easy climbing to get the blood flowing a bit. Remember to breathe during the movements and stretch slowly, deliberately, and pragmatically. Just like climbing at that next number grade, flexibility won't happen overnight! In a sport where flexibility is so necessary, it is remarkable how little emphasis is put on stretching. When you first start, it can be painful and frustrating. For me, the biggest hurdle was focusing on sitting still and being patient, but in the end the benefits are well worth the effort. Last week we ended "Weekend Warrior" with a soul-stirring, melodically paced, artful ski edit. This week were starting off with a what-the-heck, holy-cow, those-guys-are-crazy ski edit! So let's just continue on this same track with another unbelievably crazy line. If you've seen "Days of My Youth" you're already familiar with this clip. But for those of you who haven't, prepare to have your mind blown. In an interview with Outside Magazine, Cody Townsend said he got up to 65 - 70 mph, and the exit of the chute was only about 6' wide. You'll need to see this to believe it! This weekend is the Bozeman Ice Fest and the first UIAA World Cup Ice Climbing Event held in the US. So to celebrate the Fest, I had to have a Hyalite video in here this weekend. And boy, is this a good one. Here we see Conrad Anker and Kris Erickson adding a variation to Hyalite Canyon's crown jewel route, Winter Dance. Their new line, Nutcracker, adds a M7 and a M8 pitch to the start to reach the main ice line. Not only is this a film about the climbing, but it's also a brief narrative of Conrad and his fallen friend, Alex Lowe, who this new line is a tribute to. Bruce Tremper, the author of Staying Alive in Avalanche Terrain and Avalanche Essentials was recently interviewed in a video by Black Diamond. There he talks about risk in avalanche terrain. Though Bruce has a lot of excellent wisdom in this video, there are two moments that really stand out. The first is when he says, "I will never be as confident in my avalanche skills as I was in my early twenties." And the second is when he says, "the whole extreme thing has gotten out of hand." The Controller - Salomon Freeski TV S8 E05 from Salomon Freeski on Vimeo. Dry-tooling is an interesting sport. You're rock climbing, but using ice tools. It sounds easy, right? Well think about it this way: you no longer have 10 fingers and nice, sticky rubber holding you to the rock, instead you have all your weight balanced on 4 pieces of 3-4 mm thick sharpened steel. Angelika Rainier is a master of those steel points, and in our next video she shows us how it's done in the first ascent of KamaSutra, one of the hardest dry-tool lines in Italy at D13+ (about 5.13c/d). Angelika Rainer, first ascent of KamaSutra D13+ from ANGELIKA RAINER on Vimeo. Most of the videos I put here are more fast-paced, get-your-heart-pumping, adrenaline-rush type videos. But every once in a while, I find something that might be a slower-paced on the surface, but stirs something a bit deeper in your soul. I just finished reading Barry Blanchard's memoirs, which I immensely enjoyed. For those of you who don't know who Barry is, he is a cutting edge Canadian alpinist who was most active in the 80's and 90's, and most known for establishing some of the proudest alpine lines in the Canadian Rockies, as well as pushing the envelope on high altitude objectives in the Himalaya. Barry began climbing when rock protection consisted of pitons and chocks, hip belays and home-made webbing harnesses. Free climbing rock beyond 5.8 was yet to be realized. He was born and raised around Calgary, in an impoverished and violent community, and discovered climbing at a young age. He harrowingly describes his first rock climbing experience. This kind of narrative is constantly present, and kept me on the edge of my seat throughout. Blanchard doesn't concern himself too much with trying to find a moral in his climbing, and limits his prose to incredibly descriptive stories of his life, which I have always appreciated. At times, however, Barry hits you over the head with description, and his use of simile is substantial to say the least. In most cases, his descriptions create beautiful imagery- pure poetry. The real shining moments Barry achieves in the passages of 'The Calling' are found in the relationships between he and his climbing partners. His partners are as much a part of the book as his own experiences, and he brings the reader to know them, love them, and occasionally grieve for them. 'A travel pack he had used earlier sat on his back and it had a suitcase handle on one side and a rectangular metal frame sewn inside to make it stand like baggage. The shoulder straps could be concealed by a zippered panel on the back. "T.P., you're a ... lawyer, man," David said. "Buy yourself a proper alpine pack." "Ya, you cheap b@%*," I added. "I will just as soon as we get off of this route." In some ways, I can identify with 'The Calling.' In other ways, not so much. As someone who has spent the last five years living the dirtbag lifestyle in an effort to gain as much mileage in the mountains as I can, I identify with some of his struggles, and found assurance in his perseverance. I would like to think that I am brave and strong enough to push myself to the limits some of his narrative describes, but fear that the desire to take quite as much risk as Blanchard may not be there. Still, there are plenty of passages that simply allude to his pure love of being high in the mountains, which I can whole-heartedly agree with. 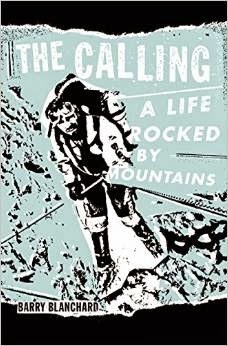 Barry is one of those great figures in alpinism who inspire so many, and 'The Calling' is an important narrative for our sport. It is real, and raw, and wildly entertaining. Whether you can relate with some of his near-misses and triumphs, are dreaming of them, or would prefer to white-knuckle your armchair, 'The Calling' is not to be missed.